THEN 20% of the profits will pay for the Shopping Center's first recycling bins, and set up cardboard recycling for the store/deli. 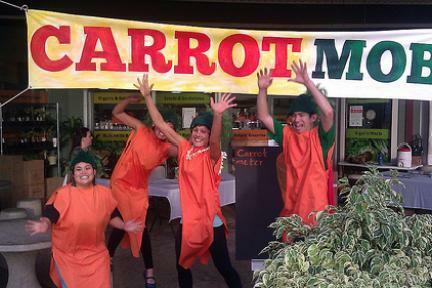 Kanu Hawai‘i organized a consumer Carrotmob to support the efforts of Kale’s Natural Foods to reduce waste and promote recycling at the Hawaii Kai Shopping Center. The goal was to raise $1,600 to set up storefront recycling facilities for the Shopping Center as well as cardboard recycling for the store/deli. This CarrotMob was organized as part of Kanu Hawai‘i’s No Waste Challenge, a campaign spanning the December holiday season, which aims to divert 50,000 pounds of trash away from Hawai‘i’s landfills. We met our goal: $1600 to set up recycling facilities for Kale’s and for customers of Hawaii Kai Shopping Center - AND Kale’s had their “2nd Best Day Ever” in sales and “Best Deli Day Ever” (the first best day ever was their grand opening). They had exactly double the normal sales for a Saturday, and we logged 452 transactions at the register. We reached our goal, so Kale’s will be setting up store-front recycling facilities for customers at Hawaii Kai Shopping Center (which doesn’t otherwise have recycling bins), and start cardboard recycling for their store/deli. We did it!! !